Israeli aircraft pounded targets in the Gaza Strip early Monday after rockets were fired at Israel from the territory, the military said, unsettling a tenuous ceasefire between Israel and Hamas. The military said its aircraft struck two weapons storage facilities and a rocket launch site. No injuries were reported. Rocket fire from Gaza has declined since Israel carried out an eight-day military campaign last November in response to frequent attacks. An Egyptian-brokered ceasefire has largely held, but sporadic fire still persists. 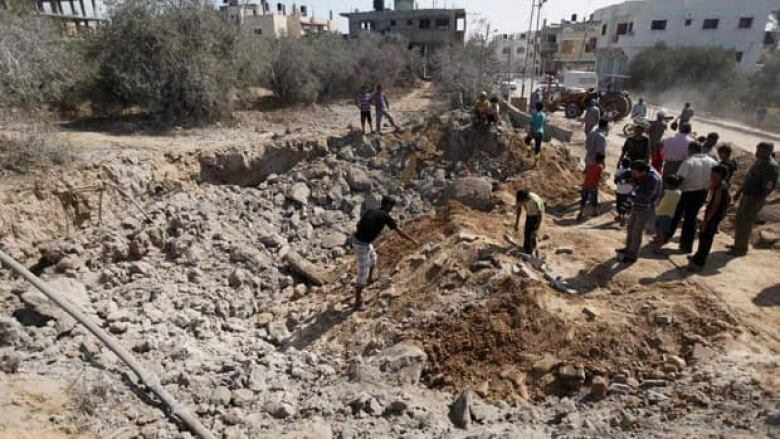 No militant group claimed responsibility for the rocket launch, but Israel said it holds Hamas, which rules the coastal territory, accountable. "Last night's rocket attack is an intolerable act of aggression against Israel and its civilians. Hamas is held accountable for all acts of terrorism deriving from the Gaza Strip," said military spokesman Lt.-Col. Peter Lerner. Israeli police spokesman Micky Rosenfeld said a total of six rockets were fired at Israel overnight, causing no damage or injuries. The military said two rockets were intercepted by the "Iron Dome" missile defense system. The other four landed in open areas. Israeli Prime Minister Benjamin Netanyahu responded to the rocket fire, saying "my policy is to harm whoever tries to harm us ... That is how we will work and will continue to act against threats that are close and threats that are far." In Gaza, Hamas Prime Minister Ismail Haniyeh said he would not be intimidated by Israel's strikes. "Any Israeli aggression does not scare the Palestinian people," he said. Israel last struck in Gaza in April, when its aircraft hit and killed a top militant in a shadowy al-Qaeda-influenced group who had been involved in a rocket attack. The rocket was launched from Egypt's Sinai Peninsula, where Gaza militants are believed to operate. A rocket last landed in Israel in May. Meanwhile, Israeli police said that vandals slashed the tires of 21 cars in an Arab neighbourhood of east Jerusalem. The vandals also scribbled slogans on nearby walls. It was the latest in a wave of crimes linked to Jewish extremists that has targeted mosques, churches, monasteries, dovish Israeli groups and even Israeli military bases to protest what they perceive as the Israeli government's pro-Palestinian policies in the West Bank. Vandals call the attacks the "price tag" for the policies they oppose. Last week, vandals struck an Arab village outside of Jerusalem that has been a model of coexistence in Israel. Rosenfeld said police were investigating. He said no arrests have been made in the recent string of similar crimes.